Are the 1% eating the planet? Existing analyses of the linkages between inequality and ecological damage have tended to the relatively general. Dario Kenner’s just-published working paper sets out to go further in one particular direction, by focusing on the impact of (over)consumption patterns of the very richest in each society. You might think that this looks a bit like directing blame before the verdict is in – so I should say that this is not what the paper does. But also: given how many papers have been written about the damage done by the consumption of the poor, one alone looking at the richest won’t tip the balance. In fact, I’d take a bet that there are fewer papers with the current slant than there are studies focused just on the environmental implication of charcoal-burning by people living on lower incomes. What the paper does above all is to raise a great many questions. First of all, there are questions about data. As anyone who has worked on tax (or read Piketty’s Capital) knows well, the finances of those at the top of the income and wealth distribution have a tendency to go uncounted – not to mention the consumption. And those who work on ecological impact know how much farther there is to go in order to nail a methodology to assess the footprint associated with a given consumption pattern. The issues are of course multiplied by putting all this together with the aim of assessing the ecological footprint of HNWIs (high net-worth individuals, those with investable wealth of at least $1m), or even settling for the top 10% of households by income. Nonetheless, it’s interesting to confirm for example that while the top 10% may not consume as disproportionately as they earn, their consumption patterns are nonetheless disproportionate in terms of damaging goods such as transport fuels and meat – and in high-income countries as well as lower-income countries. that environmental taxes may have less effect on HNWIs because they can afford to pay to continue polluting. The last two go to an important issue which remains for future research: what are the marginal (rather than average) implications for consumption and ecological footprint of redistribution? It is quite possible, indeed plausible, that substantial redistribution may succeed in raising the consumption and footprint of lower-income beneficiaries, while barely affecting HNWIs who absorb any changes through saving behaviour. This is broadly consistent with the observed higher marginal propensity to consume of lower-income households. In such a scenario, inequality reduction could well exacerbate (over)consumption. Exacerbating this, if inequality also hinders economic growth as the weight of research now suggests, (over)consumption possibilities at the national level may also be expanded by redistribution. The paper’s parting shot is to note that HNWIs’ investment behaviour, on which even less data seems likely to be readily available, may actually represent the greater part of their footprint. So, are the 1% eating the planet? We don’t have good enough evidence even to start answering that. 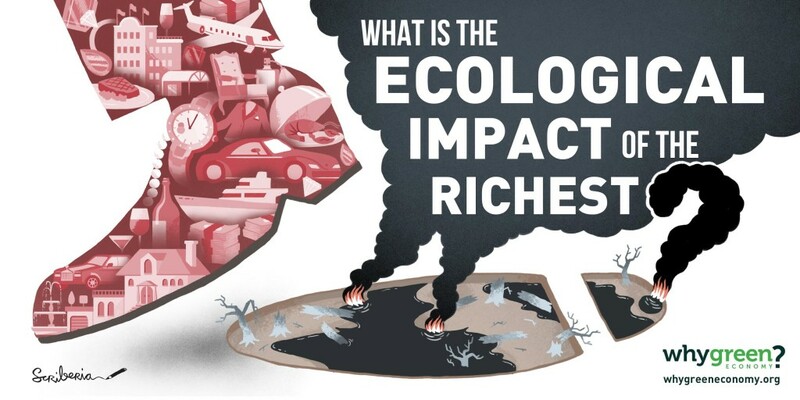 What this paper make plain, however, is that the impact of the richest is at least potentially so great that the absence of any serious data on their ecological footprint is a failing that should no longer be ignored. This entry was posted in economic inequality, Uncounted and tagged ecological footprint, environment, inequality, the 1% by Alex Cobham. Bookmark the permalink.